Plans to build a major new road in Warrington are being delayed because the government is "paralysed" by Brexit, the town's council leader said. A decision has yet to be made as to whether the government will pay for the majority of the £212m Western Link. Warrington Borough Council submitted its bid for funding in January 2018 for the scheme which would link the A56 Chester Road and A57 in Great Sankey. The Department for Transport said it was "nonsense" to blame Brexit. The Labour-controlled council's leader Russ Bowden accused the government of being "completely paralysed by Brexit". 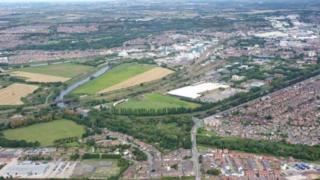 Warrington Borough Council plans to spend £70.2m on the project, which includes a high-level crossing over the Manchester Ship Canal, with the remaining £142.54m coming from central government. During a meeting on Tuesday, Mr Bowden said the council was "absolutely reliant on central government providing that money" before adding that transport chiefs would most likely scrap the entire proposal if the bid is rejected. "There isn't really a plan B," he said. "I think we have got to recognise that the government is completely paralysed by Brexit so nothing else is happening at the moment." The DfT said an announcement would be made in "due course".